Moondru Mudichu is the FIRST DIWALI RELEASE OF OUR SUPERSTAR which was released on 22.10.1976. This is his second tamil movie and again directed by K. Balachander. The film is a remake from Telugu film "O SEETHA KATHA "and in Malayalam titled as" MATRORU SEETHA". The story was written by Veteran film director K. Viswanath. After Aboorva Ragangal, Rajini was still a novice waiting to prove his mantle and KB casted him as a full fledged hero or rather a villain or best described as a SWEET RASCAL. All of our fans may have seen the movie many times and hence, it is not required to tell much on the story or screenplay. During the release, the crowds that thronged to the theatres, came in mainly for the name tag of KB. However, Rajini captured every one's attention and the talking point was "PUDUSA ORU PAYAN KARUPA IRUKAN SEMA STYLE PANNI KALAKARAN PA". The public sentiment was anonymous; a new dark villainic hero has arrived for the Tamil Cinema. 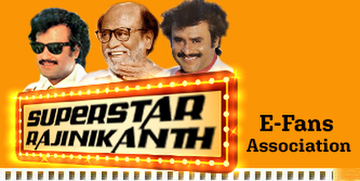 Senior fans echoed the sentiments of the public as he says "the entire theater was thrilled on Rajni's stylish acting!". KB had finished shooting the bulk of the movie schedule and was shooting the remaining portions near ERCOD hills. During the break, one of his assistant came to KB and said "Rajini is doing some funny stylish mannerisms with the cigarette and is flicking the cigarette from hand to mouth and it magically stays put. It is amazing and you must watch it!". Immediately KB summoned Rajini and asked him to perform it in front of him. As Rajini started to wave his magic, KB was thrilled and he ordered the assistants to bring a special (slow motion) camera to shoot this style. Thus, a few new styles were introduced to Tamil Cinema and all with cigarette. Rajini also chews a well lighted cigarette and makes it puff from deep inside the mouth in a stylish flash. All these magics left the viewers gasping in their mouth even with out a cigar. At the time of the release, the smokers who watched the movie definitely tried to imitate the act at least once and most of them failed, with some getting their mouth and finger injured with cigar burns, trying to flick a well lighted cigar to mouth from hand like the way our super star did it in the movie. This was the beginning of Style Samarat (ATHUKAPPURAM NADANTHATHUTHAN UNGALUKU THERIYUME). Definitely this film was a classic and film offers poured to Rajini from directors and producers for similar genre of class films. 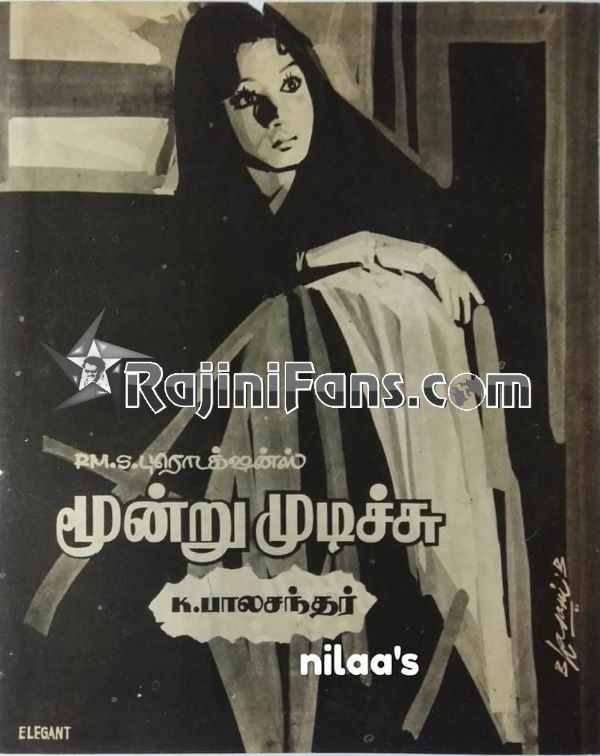 Kalignanam recommended Rajini in ARU PUSHPANGAL, followed by several such films like Gayathiri, Avargal, Aval Appadithan and many others . As far as Box office performance, this was definitely an Average hit if not a super duper hit, and despite the host of other Diwali releases stated above, MOONDRU MUDICHU was the only talk of the town. Despite being a Black and White film, produced with a low budget it managed a good run in the theatres. Remember those days Sivaji, MuthuRaman and Jai Sankar were the bigger stars and all of their Diwali released bombed at the box office. Even now the media raves about this movie and Superstar's Performance. Recently a good piece of box office information was published by Times Of India about this movie. Rajini and Sridevi got their first big break in Moondru Mudichu. M.S. Viswanathan is the first one to give voice for Rajini's song. Past his debut as a character with grey shade in APOORVA RAGANGAL,Rajini took as a totally vile character who wreaks havoc in Sridevi's life. You see generous glimpses of the wonderful actor that he is in this early film.